What Packages are Available in Your Area? Great! We have packages in your area. Less than 1,500 sq. ft.
More than 3,000 sq. ft.
Pay only $99 for parts & installation and purchase a 24/36 month monitoring contract, starting at $27.99/mo. Termination fee applies. For new customers only. See offer details below. Enter your info below to schedule your installation. By clicking 'Schedule Installation', you consent for Protect Your Home and partners to use automated technology, including pre-recorded messages, cell phones and texts, to contact you at the number provided. This includes if the number is currently on any Do Not Call Lists. This consent is not required to make a purchase. Schedule a time and confirm your order. 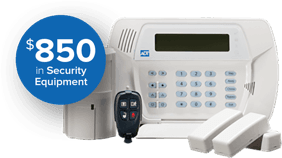 , an authorized agent from Protect Your Home, ADT’s Authorized Premier Provider will call you shortly to confirm your installation appointment on between and finalize your purchase. A copy of your order has been sent to . This offer is for new customers only. Current customers will not receive a call back.